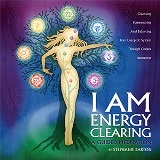 Enjoy the “I AM Energy Clearing” Guided Meditation Companion Book with journal pages! A great way to identify, explore, and discover yourself through a conscious study of chakra awareness as you practice the “I AM Energy Clearing” Meditation. Go deeper into the wonder of you through energetic evolution.